Have you told yourself this at some point this weekend? Have you told yourself that this week (starting tomorrow, because you can’t start on a Sunday can you -madness) you WILL make a change…..
You WILL change your eating habits, you WILL get to the gym, you WILL take control…. No seriously, I want to know what actually is stopping you…….. I want to know, because I want to help…..
We all need help from time to time…myself included…. I’m here to tell you that you CAN make change, you can improve, you can move forward, you can get your mojo & your sassy swagger back, & you can be that version of yourself you want to be…….. However YOU must take that first step…I can help with the rest…. 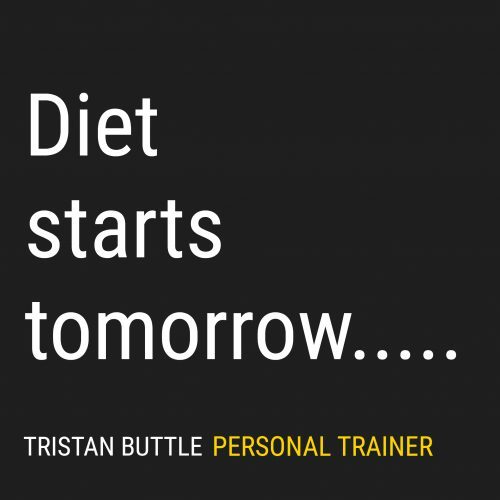 Start tomorrow, eat well, maybe train,& potentially just maybe get to sleep a little earlier than usual………. Tuesday maybe the same, fingers crossed……. Wednesday is hump day, right? You skip breakfast, start to fantasise about what you ‘SHOULDN’T’ be eating……you don’t train because you are tired, irritable & hungry…..
Friday, the weekend starts here right? YOU didn’t fail, your TACTICS failed…. See, the thing is, when you have dealt with this many many times (as I have), you see patterns, you see ways to help people just like you, you develop strategies…. Tristan ‘always here to help’ Buttle. ← Do you want to lose weight?